Hello everyone! 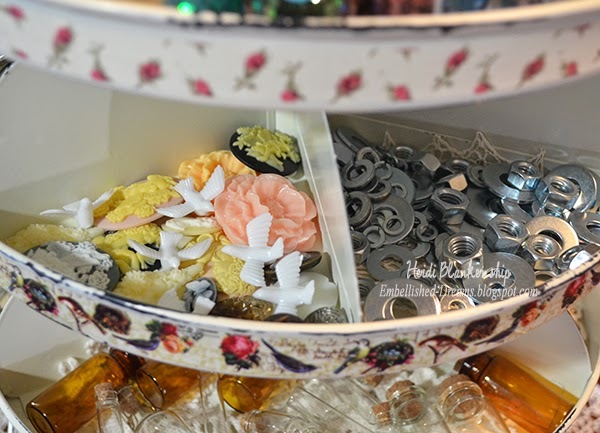 Today, I have a blog post with a little bit of this and that and a ton of pictures LOL. Just kind of a mix of a few things and what I have been up to. 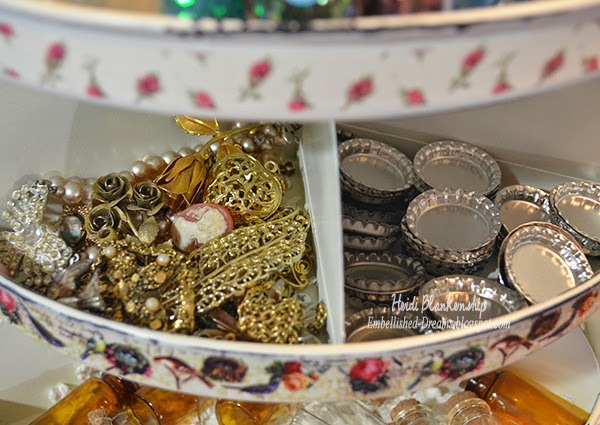 The first thing is the Sunday Earring Challenge over at the B'sue Boutiques Creative Group on Facebook. 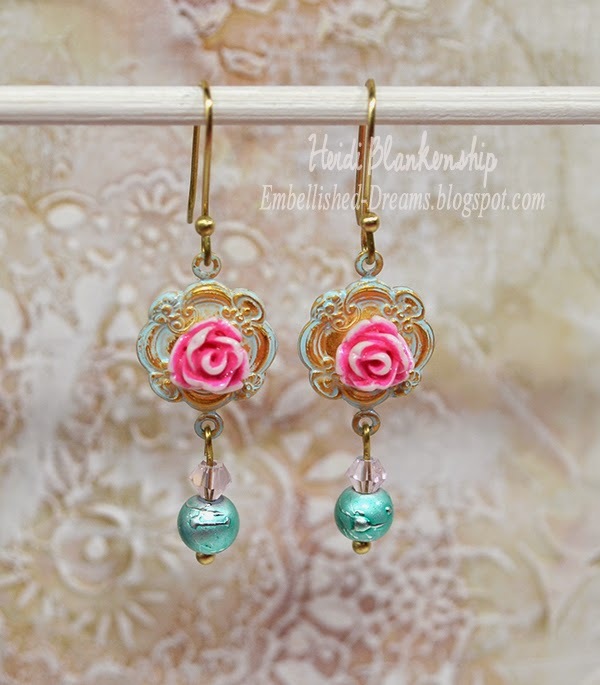 This is just a fun challenge to keep motivated during the week and all you have to do is make a pair of earrings on Sunday (more than one pair if you want) and post it to the group and on the Pinterest board. 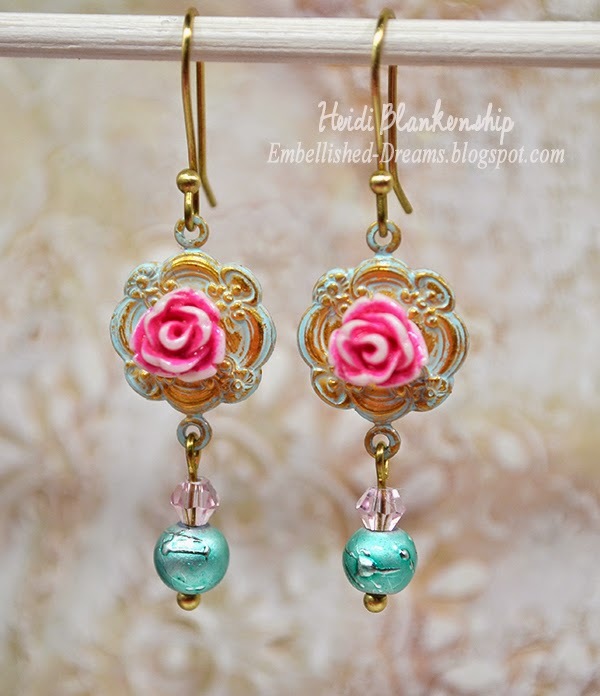 These are the earring that I designed for the Sunday Earring Challenge. I had so much fun making these. I used some small connectors and Spectra beads from B'sue Boutiques. To colorize the roses and connectors I used Ranger Vintaj Patina--Ruby, Quartz, and Marine. 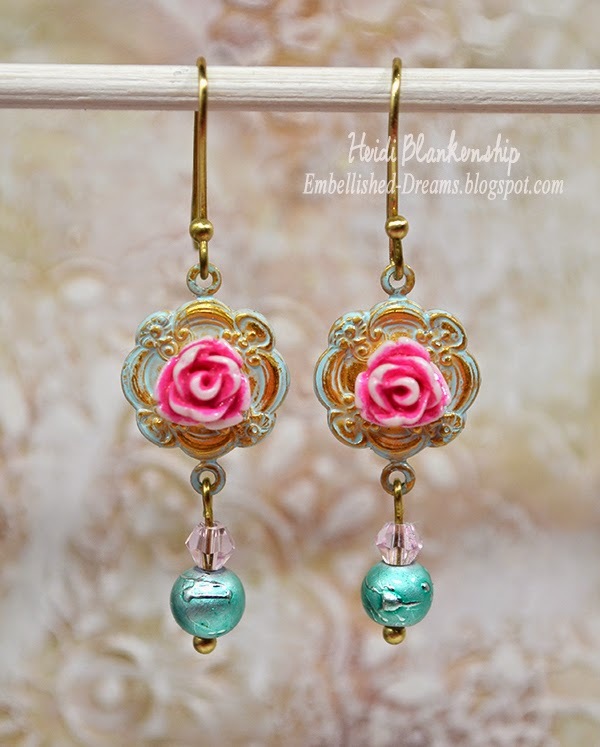 I love how pretty and shabby these earrings turned out. I was very excited to see my earrings in the B'sue Boutiques Newsletter! You can click HERE to see the newsletter. 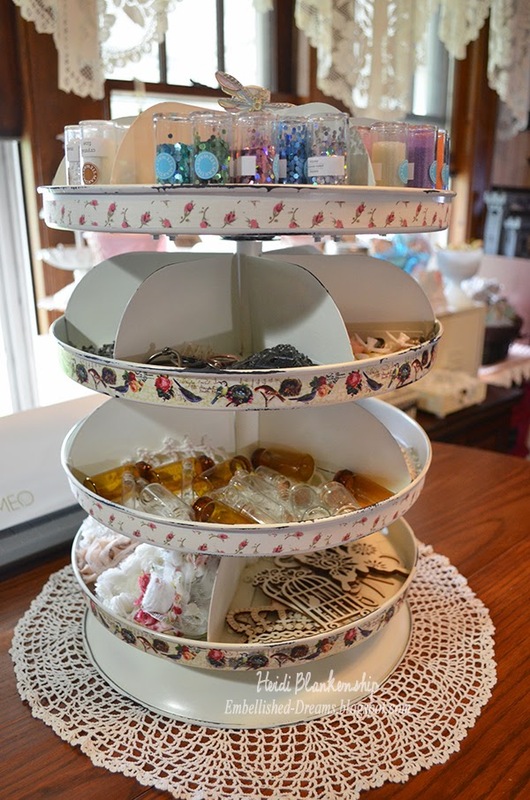 If you love to make jewelry I hope you will check out B'sue Boutiques! 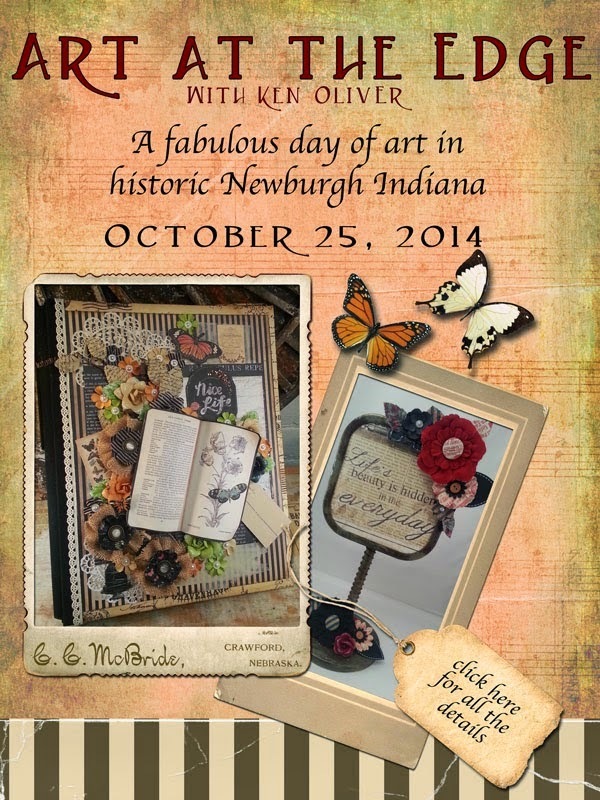 As some of you might have seen of Facebook I am going to be attending Art at the Edge in Newburgh, Indiana October 25, 2014--I am so excited to attend this event! 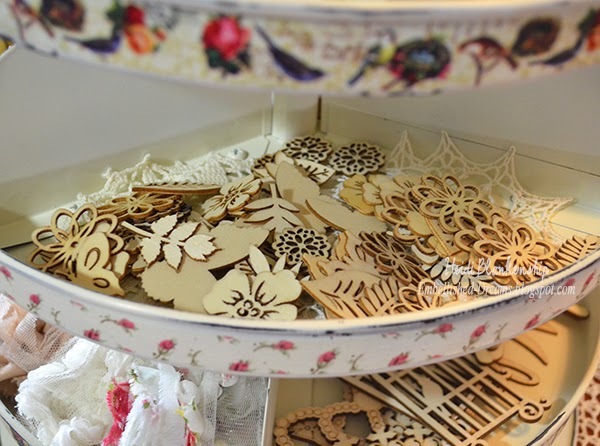 Ken is offering two wonderful classes with paper crafting and mixed media. The class includes a wonderful lunch at The Edgewater Grille. There will also be some time to explore the town and for a little shopping. 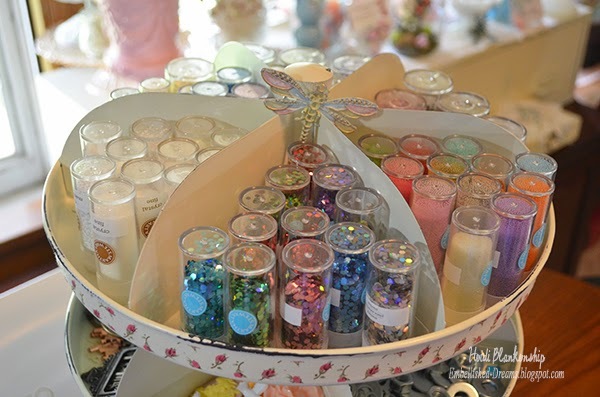 Plus there is going to be a Fabulous Swag Bag from Prima!! If you are interested in attending you can click HERE for all of the information--but there are only a few spots left! 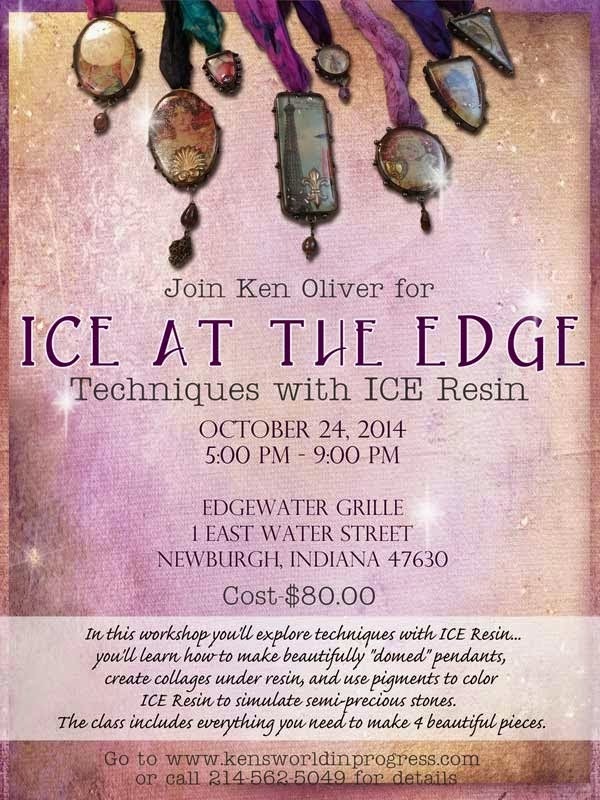 Several people who are attending the event are staying in New Newburgh for the weekend (myself included) so Ken is offering another class for Friday night--ICE at the Edge--Techniques with ICE Resin. You can click HERE for all the details. The other reason I am so excited for the weekend getaway is I will be hanging with the girls--Debbie Seyer and Sherry Cheever. Can't wait to see them and have a fun filled weekend!! Now this is something a little different but I just wanted to share it with you. 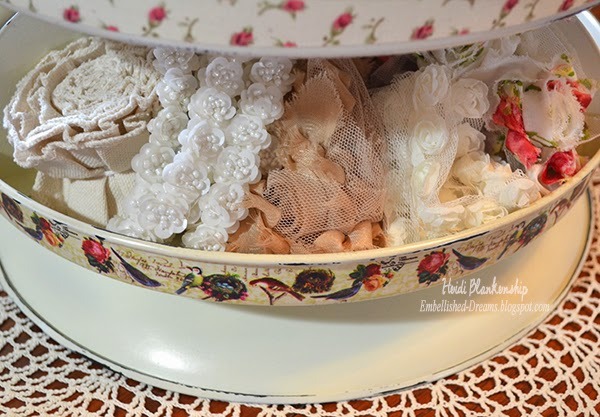 This is a revolving bin that I altered for my craft room. It came from Harbor Freight, in a box--lots of pieces--LOTS--and it was black. I won't lie it took at least a good hour if not more to put this little baby together. It's not hard just lots of pieces LOL! But I love how it turned out!! After I assembled all of the trays I spray painted it. Then I used some steel wool to sand and distress the edges a little. 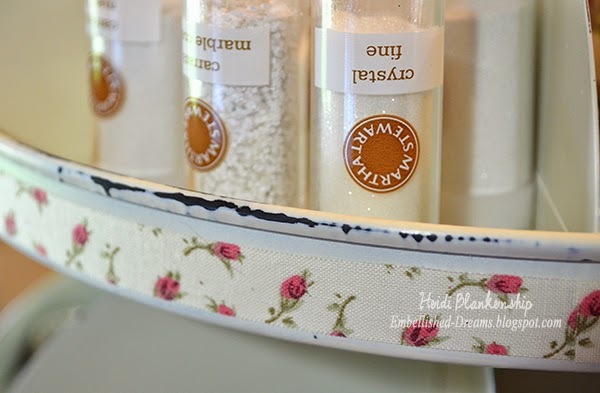 To finish it off I added some floral rose fabric tape and some beautiful washi tape with birds and flower and then I filled it with goodies. I watch a lot of YT videos and several people were purchasing these bins and altering them to match their rooms. You can click HERE to find out all of the details about the revolving bin and order it if you would like. Here are a couple of close up pictures so you can see the tapes and how I distressed the edges. 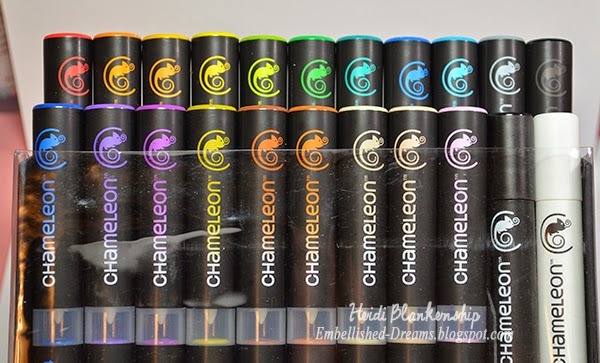 So excited to have the NEW hot of the production line Chameleon Color Tones Markers!! Chameleon Color Tones will be available to Ship October 1st! 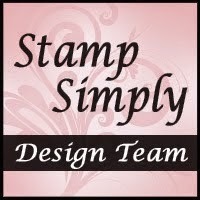 You can click HERE to sign up for the Chameleon Art Products Newsletter. Check out all the pretty colors!! 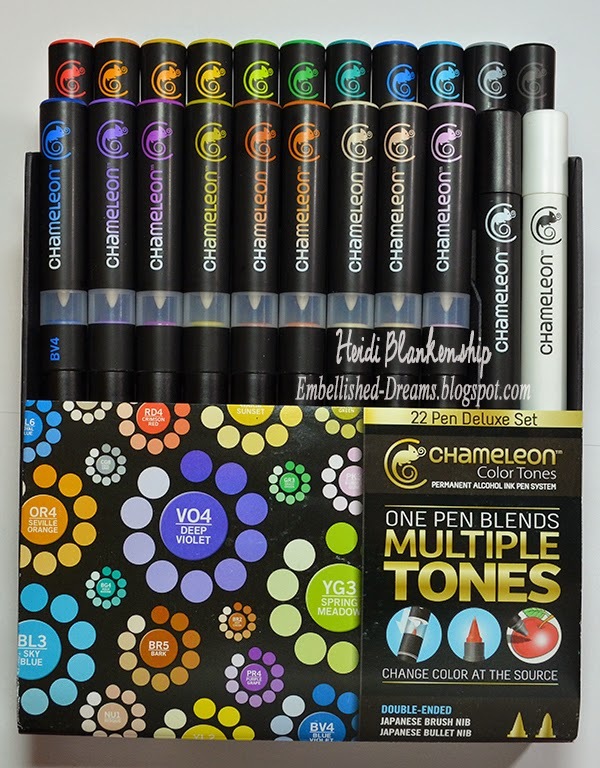 Be sure to check back tomorrow and I will have a project to share with you using the Chameleon Color Tones Markers. 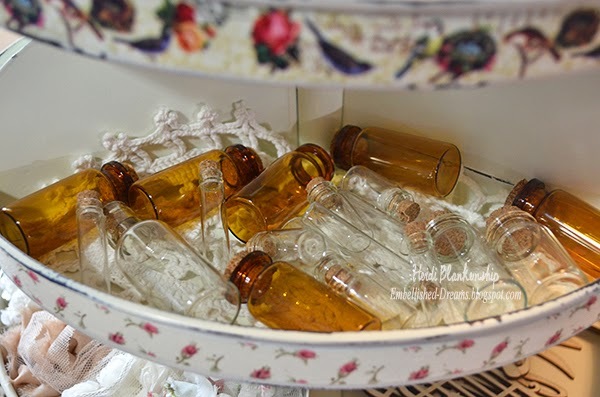 Today over at B'sue Boutiques Creative Group on Facebook it's Work Table Wednesday. This is what's on my table. For the challenge I have until Friday to post pictures of what I created using these pieces. Wish me luck LOL! 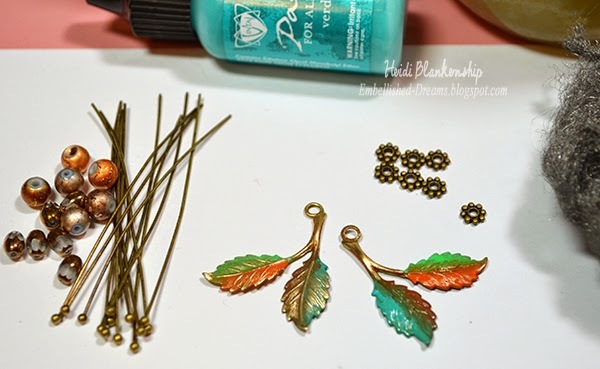 I am planning to make some earrings with these little brass leaves and the Spectra beads. 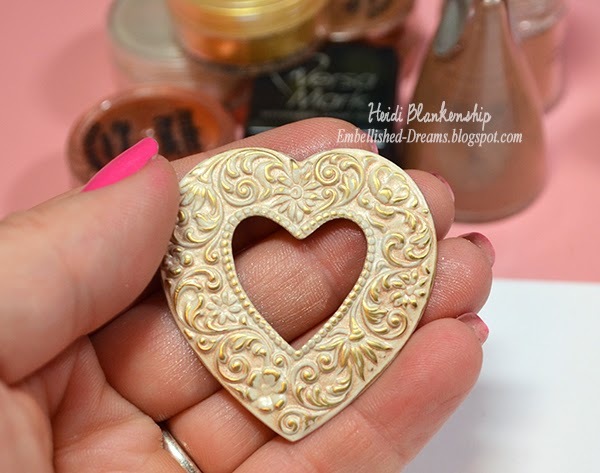 Other then a necklace I an not really sure what I am going to do with this backless brass heart stamping. But I will share the finished pieces with you later in the week. Wow! What a picture filled post LOL! But I hope you enjoyed the pictures and projects I shared with you and they inspire you to create something fun. lots of little bits . . . I am so envious that you are one of the lucky souls going to Ken's art workshop! the bin from Harbor Freight? I bought it almost 2 years ago and used it mercilessly. I decided to relieve it of its overworked duty and reassigned spaces. It still sits where it has been but I've been thinking about putting it in a recycle sale. THEN I see your posting; of course I did not dress mine up and it's still black. 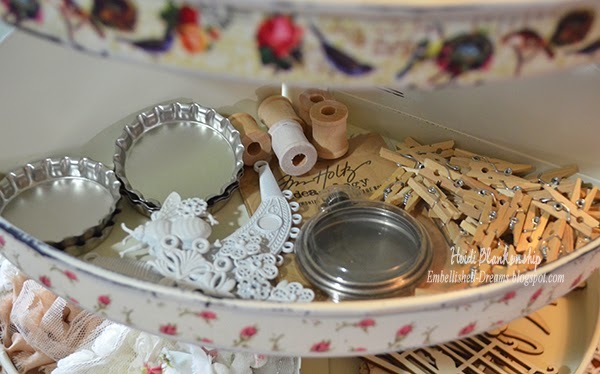 however, as I admire yours, I am now thinking about up cycling it and putting the embellishments in there, similar to what you've done. and then those chameleon pens? 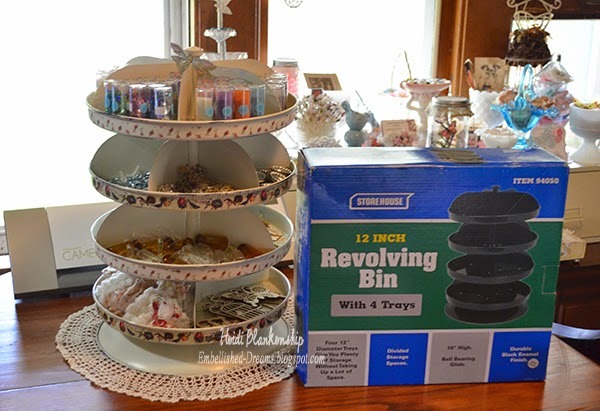 I've been watching Cathy Andronicou use them and she says she loves them, so I've anxiously awaited their arrival in the US. 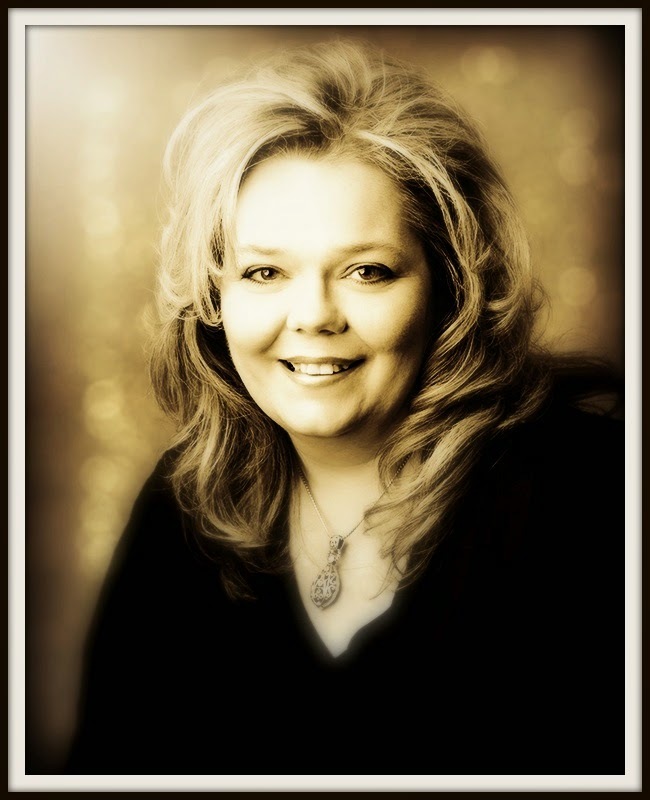 I'm so lucky to have checked in on your blog again! thanks so much. I sure did enjoy your post here. I read everything! I love the earrings in the beginning and wonder what your second earring will look like! Have a grand time with your Friends at the weekend with Ken Oliver! Wish I could be there too! have a great time in Indiana ! sounds like a wonderful experience. your pictures are evidence of your creativity. 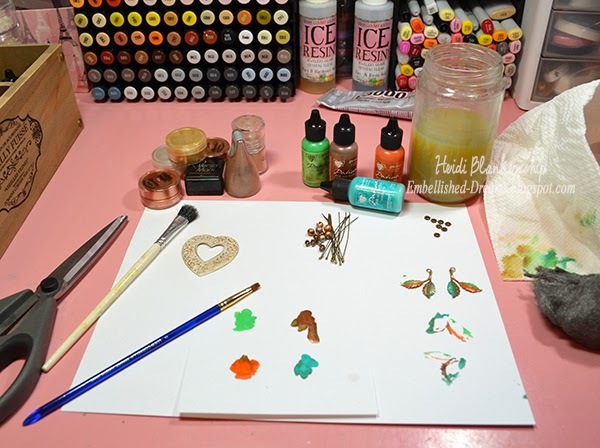 and I love those colorful brass leaves on your worktable. can't wait to see what happens there. Wow, that bin is exactly what I've been looking for only didn't know where to look. Just saw yours and called my local Harbor Freight to make sure they had them. Will be picking one up today. Thank goodness I didn't get something I saw in a local craft store that I knew I wouldn't really be happy with. This is perfect. Oh, how I love Harbor Freight. Thanks so much for sharing. 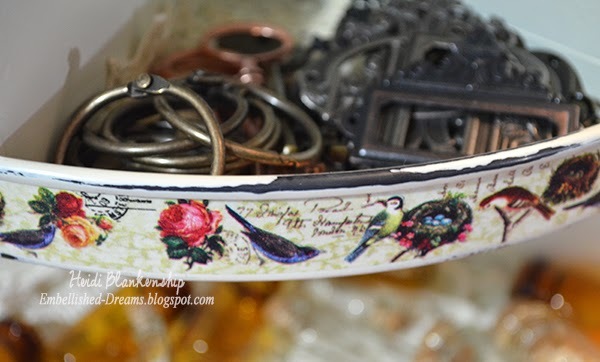 Oh, and I just picked up some amazing Martha Stewart vintage prints washi tape yesterday that will be PERFECT for this bin. WOW love your bin!!! Such a great idea. Can't wait to see your projects from the Ken Oliver class!